In general, when I send a 50 foot training leash out to one of you, I make sure that the leash is as "pristine" as it can possibly be. However, every so often I come across a leash that's got a slight discoloration, or a minor irregularity in the weave, and I set it aside in a stack. I have about 10 of these available right now, and so I thought that I'd offer them for sale at a special price ($25 instead of the normal $30), and that I'd give readers of the NaturalDogBlog a special heads-up about the discount. The discount is only available as long as supplies last, so if you're gearing up for training season, now is your chance to get an even BETTER deal on a great leash. Head on over to the store page, and you'll see a drop-down above the "Buy Now" button that lets you select the discounted leash option. Quick DVD update: We're about midway through editing the 2nd DVD now, we've negotiated a contract for duplication, and the design for the packaging (you do want it to look pretty, don't you?) is also underway. The only "surprise" for me was that there's quite a bit of lead-time in the duplication process. While I had intended to wait for both discs to be finished, this might mean that we end up shipping the 1st and 2nd DVDs separately - since DVD#1 could be ready to ship by mid-April, and DVD#2 will be ready around the 1st week of May. I thank you all for your patience, and REALLY appreciate the pre-orders (they will help cover the duplication costs). Happy Spring to all of you, and, as always, if you have any questions, don't hesitate to contact me. I also hope you all got a chance to read my article on What to Do When Your Dog Is Aggressive - which will hopefully be a useful resource should any of you run into someone who's unsure how to handle an aggressive dog in their life. 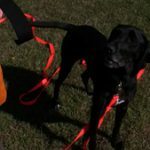 UPDATE: All of our sale leashes have been purchased - please stay tuned for more sales and special offers for Natural Dog Blog readers, however. Thank you!